She portrays another image amongst All First Ladies in Africa. Full Names Chantal Pulchérie Vigouroux Biya was Born in 1971, Chantal Biya is 38 years younger than her husband Paul Biya. Differentiating herself from other African First Ladies, Chantal Biya is rather unique, spontaneous, funny, impulsive and natural therefore creating an image of buzz and admirers. Known for her iconic multicolored hair and flamboyant exceptional dressing style. Ambassadrice de bonne volonté de l’UNESCO. Here are 20 little known or unknown secrets of the first lady of Cameroon. 1. Chantal Pulchérie Vigouroux is French of origin. Her mother is from Dimako, a small town in Eastern Cameroon and her Father is from France. 2. Chantal Biya is the only child raised by a single mother, Rosette Ndongo-Mboutchouang. She has never met her French father, Georges Vigouroux, a former employee of the Société Forestier et Industrielle de Bélabo. 3. Chantal Biya‘s mother was a former Miss Bertoua (1967), who became mayor of Bangou in 2007 before stepping down in October 2014. 4. 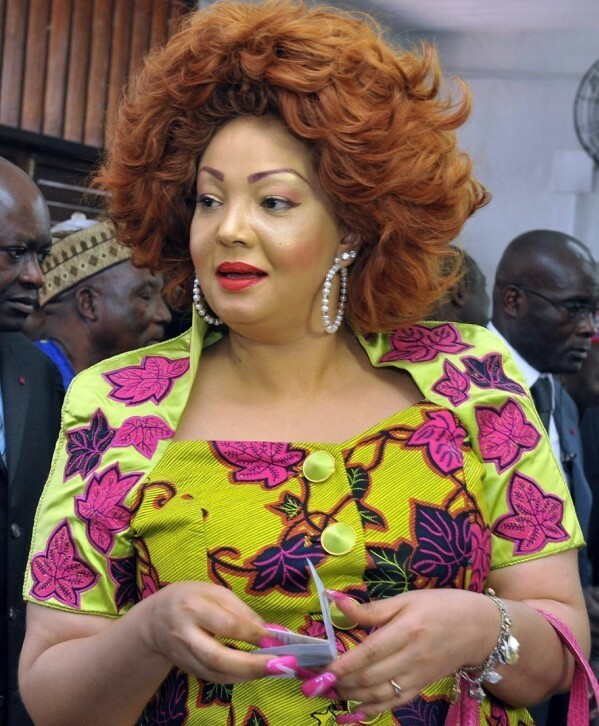 Adolescent and already a mother of twins (Patrick and Franck Hertz), Chantal Biya was a model, parading local fashion shows in Yaoundé and Douala. 5. She was also a waitress in a restaurant in Douala when she was still in college. 6. According to the President’s biography (The Secrets of Power, Karthala, 2005), the love affair between Chantal Biya and Paul Biya occurred in 1993 at the birthday party of the Head of State In Mvomeka’a, his native village. 8. Chantal Pulchérie’s ex-husband Vigouroux was an anglophone and a taxi driver. They lived in Yaounde until the day when the love affair of Paul Biya came to separate the couple. 9. She was regularly welcomed at the Presidential Palace at the age of 23 by President Paul Biya. 10. Yaou Aïssatou, former minister of the Status of Women, was the godmother of Chantal Biya when she arrived at the Palace. 11. The marriage of Chantal and Paul Biya on 23 April 1994 has fewer guests as the official union of the presidential couple was totally discreet. • Habissou Bidoung Mkpatt, wife of the Minister of Youth and sports and secretary-general Chantal Biya’s Foundation. • Nathalie Engamba Ada, wife of Adolphe Moudiki, the influential CEO of the National Hydrocarbons Corporation. 14. At the 2002 African Cup of Nations in Mali, Chantal Biya had sent a military plane loaded with food and dispatched four cooks to feast the Cameroonian delegation with local foods. 15. Fuchsia suits, assorted high-heeled pumps, her outfit is in her image: baroque and energetic. She wears many foreign designs like Chanel or Dior; she also loves her own designs. 16. Despite the requirements of the protocol, the first lady likes relaxation and naturalness. When she is free, Chantal Biya takes English classes at home and tries to strengthen her political culture and readings. 17. Chantal Biya’s favorite animal is a parrot and she has a pet parrot that she feeds with her own hands in her Etoundi Palace. 18. Chantal Biya loves her family from the East, her region of origin. • Former Mayor of Dimako’s hometown, Jan Mongui Sossomba, promoted to President of the Chamber of Agriculture in 2011. • Hilarion Etong, First Vice-President of the National Assembly. 20. Chantal Biya had done everything she could to avoid the imprisonment of Marafa Hamidou Yaya, former secretary-general of the presidency, whose children were friends with Anastasie Brenda Eyenga and Paul Biya Junior, (children of the presidential couple). Album Review: Melcube – Songs I Never Released.